Bus route M-110 Málaga-Torremolinos-Benalmádena Costa: will works on December, 8th as a saturday working day, with 55 outward and return departures, from 06:00 to 02:00. 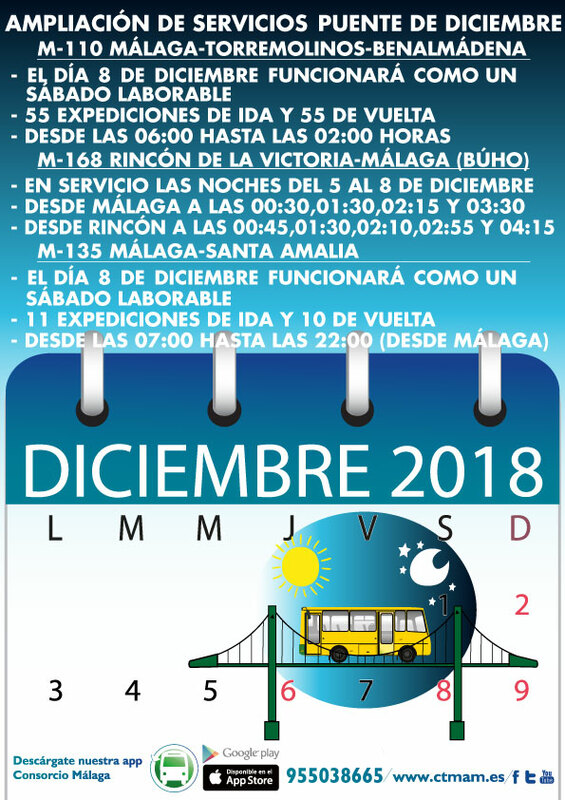 Bus route M-168 Rincón de la Victoria-Málaga (Búho): usually works only on friday, saturday and bank holiday’s eve nights, but will work continuously from December, 5th to 8th, with departures from Málaga at 00:30, 01:30, 02:15 and 03:30, and from Rincón de la Victoria at 00:45, 01:30, 02:10, 02:55 and 04:15. Bus route M-135 Málaga-Santa Amalia: will works on December, 8th as a saturday working day, with 11 outward and 10 return departures, from 07:00 to 22:00. Further information can be consulted on our new mobile app Consorcio Malaga (available for Android and iOS), on the Consortium’s web, on its official Facebook , Twitter and YouTube page, or by calling the customer service line on (+34) 955 038 665.